Our super-talented barista Miranda made this very handsome promotional poster with her own two hands. You know what we really love over here at Kos Kaffe? Good vibes. And the good vibes were humming this year on International Women’s Day. Full disclosure: we’ve got a lot of women working here in the café—baristas, cooks, our coffee roaster, Sam. We wanted to do something that would make an impact close to our hearts. The coffee-growing industry is overwhelmingly powered by women: in some regions it is estimated that women do as much as 70% of coffee supply chain work, but only 15% of the coffee grown is in their name. These women are often working in countries where quality of life is poor, gender inquality is rampant, and health services in particular are expensive and scarce. Grounds For Health is an organization dedicated to helping women in major coffee-growing countries like Ethiopia, Kenya, and Peru gain access to crucial, life-saving cervical cancer screenings. It's important stuff, for women and the specialty coffee industry, and we can't thank you customers enough for supporting our fundraiser for this amazing organization that day. International Women's Coffee Alliance: Empowering women in the international coffee community to achieve meaningful and sustainable lives. Cafe Feminino: Provides grants and other support for women in coffee-growing regions. Great short film by Equal Exchange coffee co-op profiling some rockstar coffee women. This year's ramps come to us from one of my favorite farms, Lucky Dog Organics in the Catskills. I love a good root vegetable as much as the next girl, but after a long winter of rutabagas, potatoes, and turnips, it's a relief spotting greenery at the farmer's market again. I especially love scooping up all those fleeting ingredients that will be gone in a few weeks' time--tightly coiled fiddleheads, pale stalks of green garlic, and everyone's favorite harbinger of spring, the ramp. At the cafe, I try to work these ingredients into the menu whenever and wherever I can, but I'm an especially big fan of the ramp's distinctly delicate allium-ness. Gentler than scallions or garlic, you can throw them into many things (you might not even realize I'm swapping ramp leaves into the frittata. I am! ), but I like ramps best when I can see and taste them. Pickling ramps has become my spring ritual. I can give the ramps a center stage on which to shine, and keep the season going a little longer for all of you at the cafe. Win-win. This year, we're serving the ramps in our spring market salad, a celebration of the first market asparagus, crisp watercress, and tiny fingerling potatoes. But at home, I will eat them straight from the jar, or alongside a grilled cheese sandwich. They're basically made for charcuterie platters, if you've got a fancy something coming up. This is a solid, basic recipe, but you can experiment with different spices and seasonings if you like. Oh--and did I mention this takes 15 minutes, start to finish? Enjoy! Trim the hairy bottoms from the ramps and discard; remove greens and save for another use (they're excellent for compound butters, pestos, stir-fry, and egg dishes). Place ramps in a clean, dry quart-sized canning jar. In a non-reactive, heavy saucepan, combine remaining ingredients. Bring to a simmer and cook, stirring until sugar and salt is fully dissolved, 3 to 5 minutes. Pour brine over ramps. Cool to room temperature. Cover and store in the refrigerator. They'll be ready to eat in a day or so, and will keep for up to 3 weeks. I'm unfailingly happy whenever I have a chance to do a cooking event, because I always leave a little bit high on the positive energy of people connecting with each other over food and cooking. So when the NYC Greenmarket asked if I would spend a day at the farmer's market in support of their Regional Grains Project, I was one big YES. I spent pretty much every weekend in my 20s selling fruits and veggies at markets around the city, wrote this farm family cookbook, and work hard at the cafe to use local products as much as possible. In short, the love runs deep (as my over-stuffed fridge is always reminding me). My "soup-erb" fellow cook, Kenny Dawes, and me gearing up to warm some bellies. In case you aren't familiar, the Grains Project is a fantastic initiaitive to revitalize and sustainably scale up the production of grains in the Northeast. For example: Did you know that because of the Grains Project, any baked good you purchase at the Greenmarket must contain at least 15% locally grown and milled grain? Or that Greenmarket bakers use 65,000 pounds (pounds!) of locally milled flour each month? You can now find the coolest products right at the market, from emmer (farro) to spelt berries to einkorn flour to the insanely fragrant bag of roasted white cornmeal I took home with me (full product list and where to find them here). The grains booth at the Grand Army Plaza Greenmarket. All of these New York-grown grains could be in your pantry by this time next week. 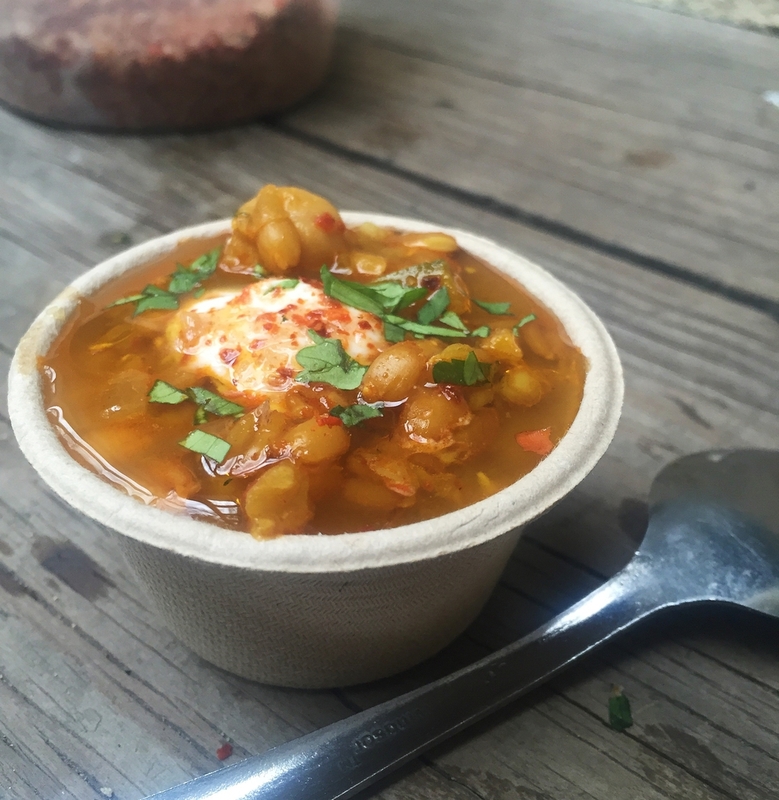 Greenmarket asked me to share a grain-filled dish at Park Slope's Grand Army Plaza market. Since it was the weekend before Thanksgiving and finally getting a little blustery, I simmered up a pot of Moroccan-inspired harira, a hearty autumnal soup that I laced with spelt, pumpkin and fragrant spices. We passed out recipe copies at the market, but underestimated the enthusiasm of hungry lunch hour shoppers so--oops!--we ran out; as promised, I am including the recipe below for all of you who missed it. Thanks again to June Russell, Gabriella Stern, and the wonderful Greenmarket folks for having me, and of course, a big thanks to all the customers who stopped by and left me buzzing yet again. Okay, there's more: In addition to spelt and pumpkin, you will also find chickpeas, lentils, and fennel lurking within. Hearty AND healthy. Spelt is an ancient wheat variety with a sweet, nutty flavor and chewy texture similar to wheat berries, but if you can't find it, don't sweat it. This adaptable recipe will be just as happy with freekeh or emmer or your other favorite local grain, though you may need to adjust the cooking time. 1. Warm the oil in a large pot over medium heat. Toss onions with 1/2 teaspoon salt; stir into pot with 2 tablespoons water. Cook, covered, over medium-low heat until very soft, 7 to 10 minutes. Uncover and continue cooking over medium-high heat until onions begin to brown, about 10 minutes more. While the onions are cooking, finely chop the cilantro stems. Stir stems into the pot, along with fennel and garlic and cook 2 minutes. Stir in spices and tomato paste; cook until paste begins to caramelize, about 2 minutes. 2. Stir in the stock, 2 cups water, spelt, chickpeas, lentils and 2 1/2 teaspoons salt. Bring to a gentle boil over medium-high heat. Stir in saffron if using and reduce heat to medium. Simmer steadily, uncovered, 15 minutes. Stir in squash and continue cooking until spelt is cooked through, 20 to 30 minutes longer. Taste and adjust seasonings, if desired. 3. Ladle soup into bowls. Spoon a dollop of yogurt on top and drizzle with olive oil. Garnish with cilantro leaves and Aleppo pepper. Note: To make Baharat Spice Mix, in a small bowl combine 2 tablespoons sweet paprika, 1 tablespoon ground coriander, 1 tablespoon ground cumin, 1 tablespoon ground turmeric, 2 teaspoons black pepper, 1 teaspoon grated nutmeg, 1 teaspoon ground cardamom, and 1 teaspoon allspice. Yield: 1/2 cup.